Find the latest new fragrance ideas for your home fragrance collections. Derived from lifestyle trends, market analysis and data to predict the next ingredients your customers with love. The USA, UK and Germany may be leading the market now, but as China and other markets grow our trends help you develop successful ranges to target all opportunities. Each Report contains information on new fragrance notes and suggestions for how to combine these ideas and new on trend ingredients into winning scents for home fragrance collections. 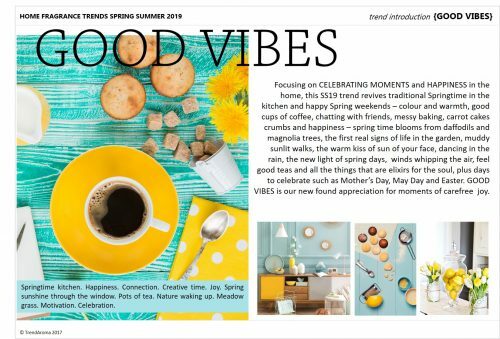 Each new trend devotes a section to current market products so you can see the evolution of the trend and get product format and new packaging ideas. 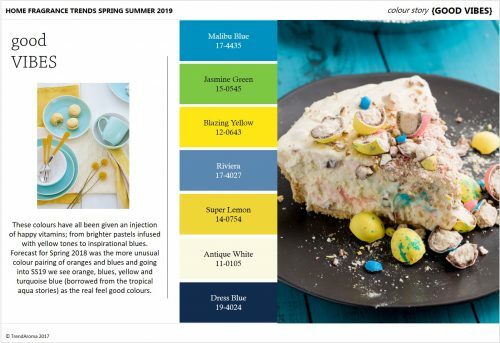 The Report contains so many new suggestions for the perfect launches to cover consumers preferences for the Spring season. Find the perfect trend concepts and ideas to produce beautiful fragrances for the summer season. This report is released twice a year and will give you and your team instant access to commercial fragrance trends and actual suggestions for the season 18-24 months in advance. All of the concepts are unique to this report and contain what will be the hottest new ideas for the season based on years of forecasting experience. 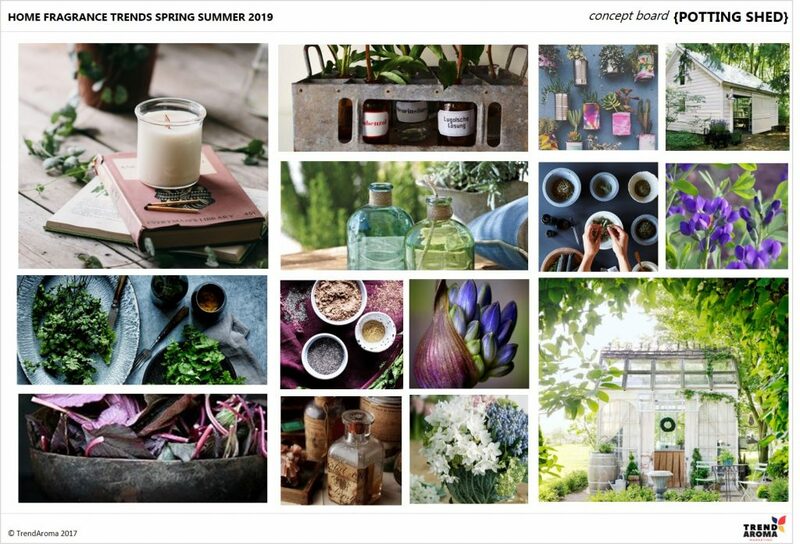 There are 134 new fragrance combinations in the SS19/20 Report to cover the top, commercial olfactive categories and give plenty of choice to fit in with new product development plans, fragrance suggestions & submissions and current or developing ranges. 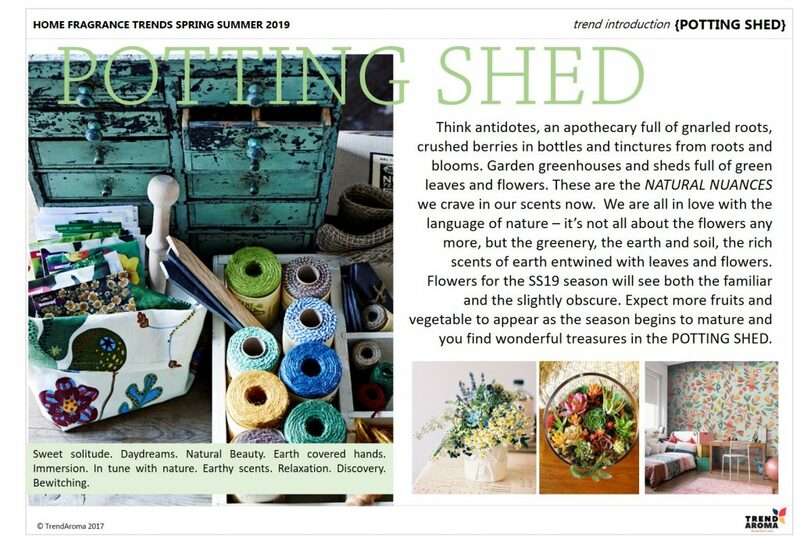 As we move in Spring/Summer 2019 we see the trend for experiences become more valuable than ever. 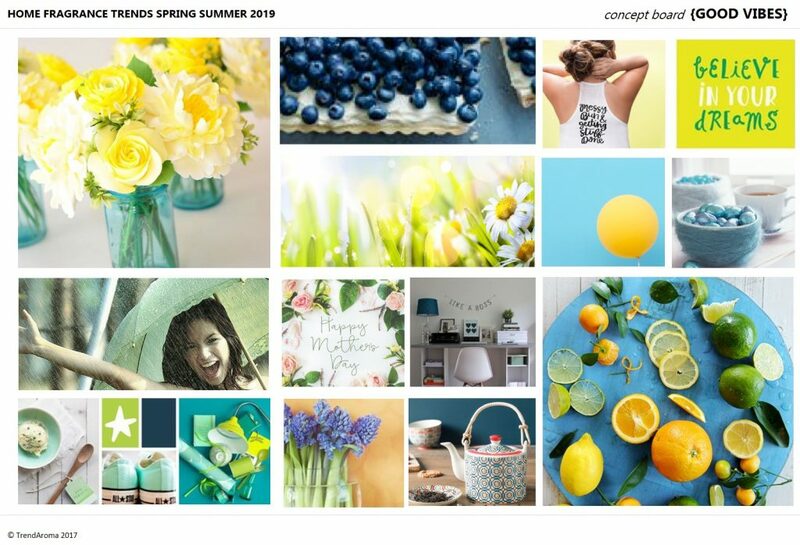 Collecting memories and moments will be the main driver of consumer behaviour in upcoming lifestyle trends. We are living, according to Trendwatching, in an Experience Economy. The 2 main trends motivating us to get better moments & experiences are wellness and wanderlust. These two drivers will have a huge impact on the scents we choose to experience in the next few years and therefore connect all of our trend stories for 2019 in some way. Consumers quest for experiences and their recognition into the vital role that fragrance plays within their homes and personal spaces alongside their willingness to try something new make for some exciting new scent predictions. Want to know the next new berry ideas, new gourmand combinations or key seasonal citrus or floral notes? 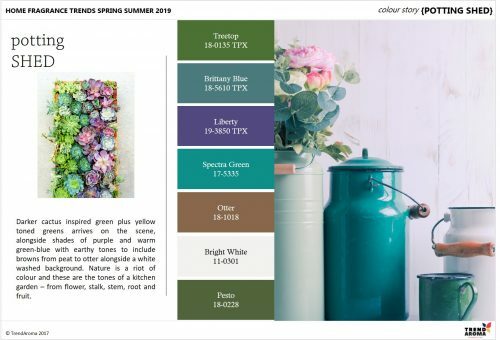 This reports gives you inspiration, ideas and ingredient combinations to launch new products in home fragrance ranges for the Spring/Summer 2019 season. Fragrance Marketing is a specialist area. 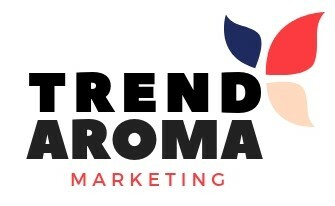 TrendAroma’s agency services are unique to the fragrance world, built on experience and understanding of the industry. We forecast and develop trend and market information into ready made reports and trend forecasts designed specifically for the fragrance sector.